The har gow dumpling originated in a teahouse in the Wucu village, a suburban region of Guangzhou. It appeared on the outskirts at a teahouse in the Wucu village; the owner was said to have had access to a river right outside, where shrimp would be caught and directly made into the fresh stuffing for har gow dumplings. Teahouses sprung up to accommodate travelers who were tired after journeying along the Silk Road. Rural farmers might also go to the teahouses after a long day of working in the field to enjoy an afternoon of tea, dim sum, and relaxing conversation. Today, har gow can be found in most restaurants and teahouses in Guangdong, China. Local people order these shrimp dumplings when they drink their tea at leisure time. 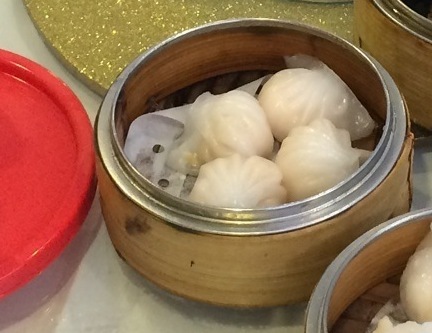 Dim sum became popular during the Tang Dynasty. Its origins are Cantonese, and dianxin was the northern way to say it. In the Guangdong Provence and in Guangzhou, they call “dim sum” “yum cha”. Dim sum was popular in the south, where many people went to and still go to restaurants early in the day to enjoy these labor-intensive small bites. This was usually the first eating time of the day. There were many recipes for dim sum in the Tang Dynasty. According to the General Annuls of Shandong, Prime Minister Duan Wenchang compiled 50 volumes of dianxin recipes just from those eaten in his Shandong Province. It took centuries for the art of dim sum to develop. In the Western United States, dim sum came about as a natural result of nineteenth century Chinese immigrants settling in the East and West coasts. Some people believe that dim sum is actually the inspiration for the concept of “brunch” that we have in America today, a way to combine breakfast and lunch into a large midmorning meal. Nowadays there are vegetarian, low fat, and even health conscious alternatives for dim sum dishes.